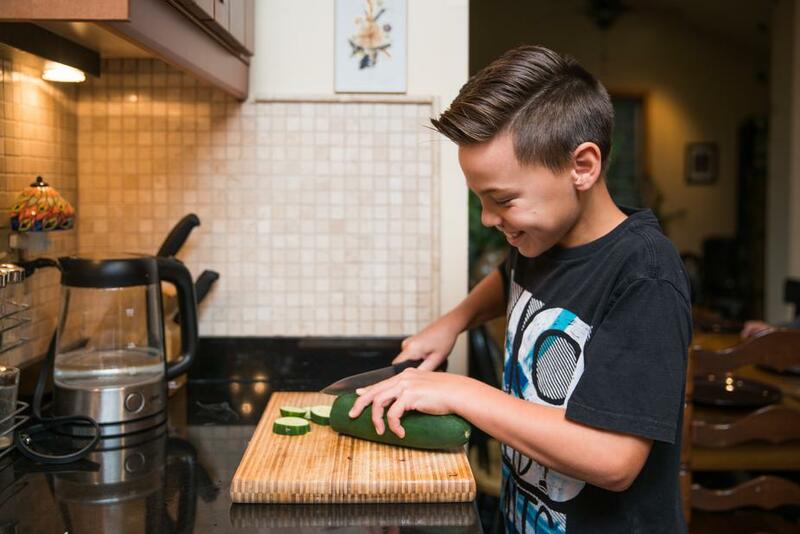 Why is it important to get your kids cooking in the kitchen? 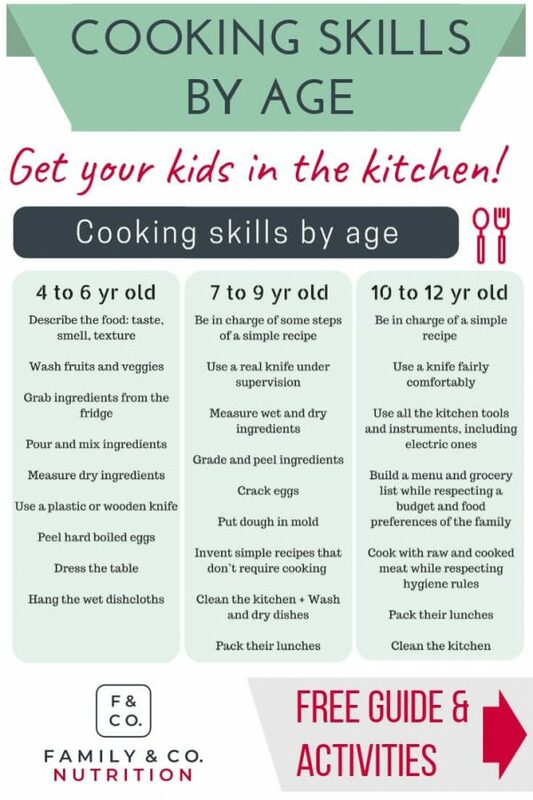 Getting your kids involved in the kitchen early on have a lot of advantages. It makes them functional and independent in the kitchen. Which parents wouldn’t want that? There is so much to learn in the kitchen! Your kid will gain skills by working with you and other family members. The skills gained in the kitchen will be useful beyond the kitchen. Teamwork and following instructions: listening to the parents’ instructions, following recipe steps, sharing kitchen space and tools, dividing tasks among people… all essential skills to work well in a team. Patience: well, you gotta wait for it to cook! Some tasks are more boring than others. All steps that require patience make you appreciate the final result. Math and scientific thinking: cooking is the science of food. Kids experiment by mixing ingredients. They practice math by calculating and measuring. They see the transformation of food into a delicious meal. It’s not magic, it’s science! Fine motor skills: mixing, measuring and cooking get kids practicing their hand-eye coordination. These skills are required for delicate movement. On top of it, cooking broadens their horizons. Kids share family traditions, learn about their cultural heritage, and try new cuisines. They learn about other cultures and taste new foods. They experience the versatility of food by cooking them in different ways. It will make them into adventurous eaters! The kitchen is a real laboratory for kids who can explore and learn at the same time. Including your kids early in the kitchen exposes them to the cooking universe. It sends the message that cooking is fun. Having you as a role model who cooks is a powerful tool in encouraging them to explore in the kitchen. By simply observing, they will learn a lot about where the food comes from and how we transform the food into meals. Getting kids in charge of small tasks will boost their confidence. You can build from it and move to more complex tasks and complete recipes as they grow. They will learn faster if they have seen you do these tasks before. Kids cooking in the kitchen appreciate the efforts required to cook delicious meals! 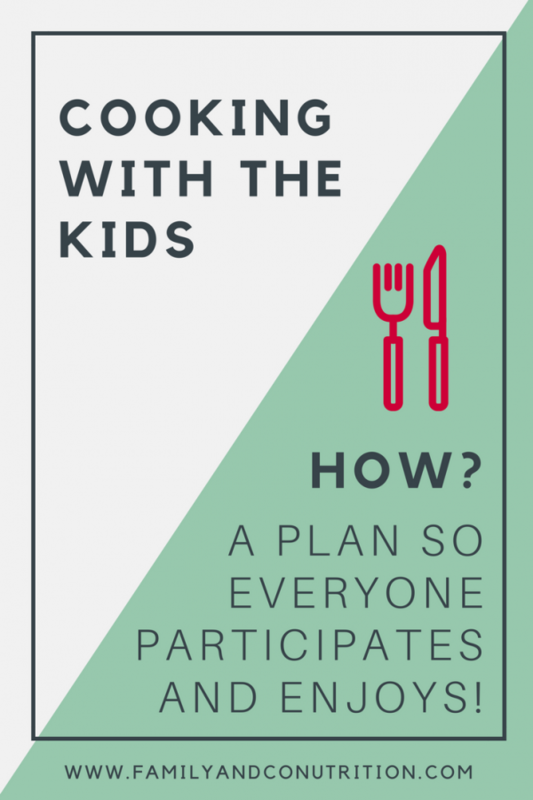 Making room for kids in the kitchen will teach them how their dinner gets on the table! 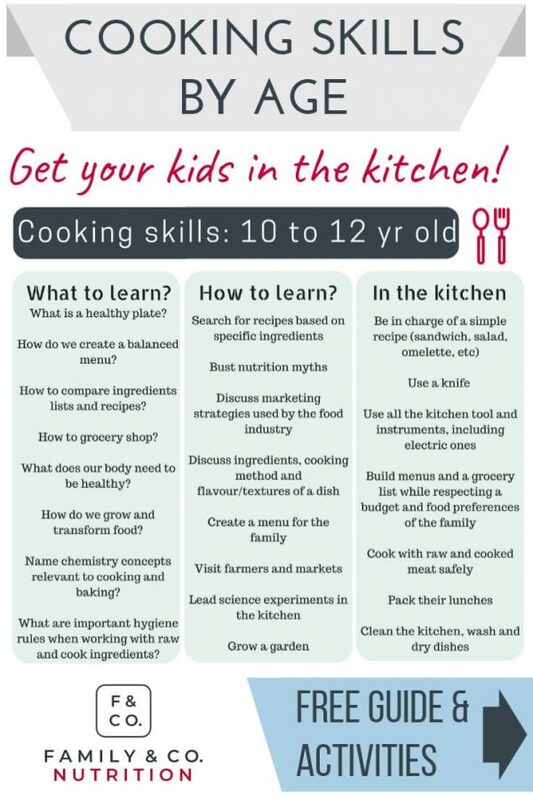 Not sure how to get kids cooking in the kitchen? We’ve prepared 3 activities for kids to explore in the kitchen, in the grocery store and at the farmer’s market or farm. Get them for free by subscribing. Why every child should learn to cook in the kitchen? Remember when your kids started to eat solid foods? A whole new world opened up for them. New textures, flavours, colors, tastes, smells… everything was new! From discoveries, they move on to learn more about food. How food grows, how to prepare and cook food, how to assemble balanced meals, etc. These are life skills that will make them into self-sufficient adults. If they never have the opportunity to learn under your guidance, it’s going to be harder to learn on their own when they leave the nest. And the sooner they become functional in the kitchen, the sooner they can participate in family meals. There are a lot of things to discover in the kitchen. Kids need time and exposure. Don’t we all want to raise kids who love eating and discovering food from various cultures? No one dreams of turning their kids into picky eaters! Getting kids cooking in the kitchen is part of our parenting duties. It’s our duty to role model a healthy relationship with food so our kids will do to. It’s our duty to support kids who will be resourceful teenagers. When they move out, it’s ideally with enough knowledge, skills, and experiences to feed themselves. Our role as parents is to make room for them in the kitchen. Of course, we can bake them a birthday cake or their favourite home cooked meal, but teaching them cooking skills is the real gift! Being able to plan and prep a meal is a real gift to offer your children. 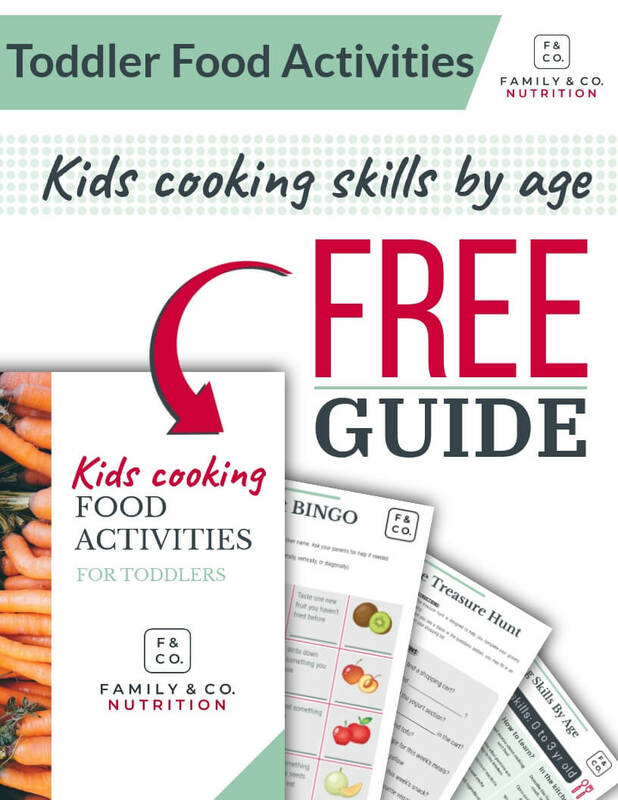 Let’s get cooking with the kids! Not sure what your kids can do in the kitchen? We have you covered! 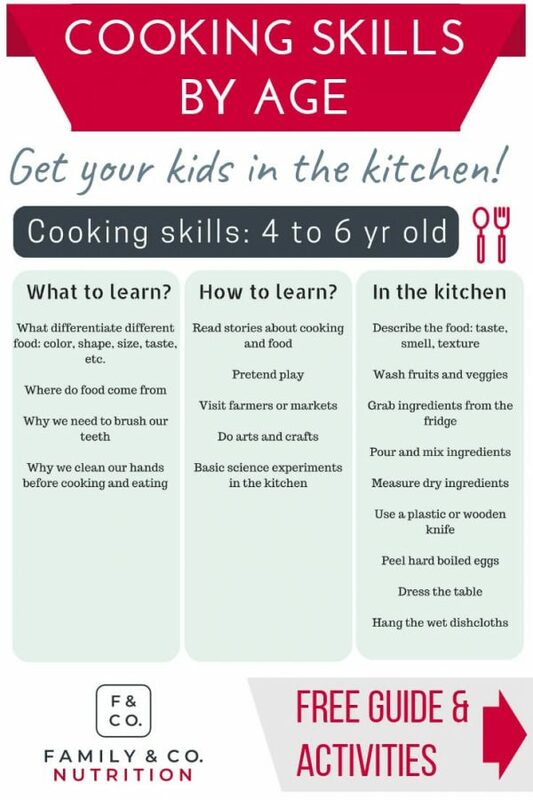 We’ve created a little guide with cooking skills per age, ideas of tasks your kids can do, and some fun activities to get them curious. Learning about food doesn’t happen only in the kitchen. It can be through books, games, at the farm, or in the grocery store! Get the kids ready and go on a treasure hunt at the grocery store, get doodling in the kitchen, or complete a bingo at the farmers’ market! Peak your child’s curiosity by exploring in the kitchen, at the grocery store, or at the library. What age should a child start cooking? The sooner the better! There is no age to start observing in the kitchen. Adapt tasks for all ages. Some safety precautions are needed for younger kids. When kids start helping in the kitchen, regardless of age, your best strategy is to cook when you have time and a clear plan. Try on a weekend and choose an easy and familiar recipe to start with. It allows you to be in the right mindset and gather your patience! You are not cooking efficiently like you might be doing during the week. And it’s not the goal. Here, you are teaching your kids. If the recipe turns out great, see it as a bonus! Put all chances of success on your side: include the kids when you have time and energy to guide them through the learning opportunity. Kids that young are curious about what happens in the kitchen. They love to observe what you are doing and to open the cabinet doors! Bring them in the kitchen early on and narrate each task you perform out loud while cooking. Idea! Make them a little box of tools that they can play with safely: plastic bowls, measuring spoons, wooden spoon, whisks. You could also do the same with fresh produce: lemons, bananas, potatoes, etc. Let them explore with their senses. Their attention span might be very short, so don’t plan a 25 steps recipe. Expect to hold their attention for 1-2 minutes per task. Assume you might have to finish the recipe alone or later. A kitchen stool or learning tower might just be the best investment to fully welcome your toddler in the kitchen. As they get more involved in the kitchen, make sure you remove all hazards: handles, sharp knives, hanging cords of kitchen gadgets, any cleaning products in cabinet they could have access to. Activities like the grocery store treasure hunt, or kitchen doodling game are good options to get kids learning about food. They might not yet be cooking per say, but they have a lot to explore and observe. Kids this age are discovering and exploring in the kitchen. They are still developing their fine motor skills, so might not be able to precisely hold kitchen tool or do small movements. They still have a short attention span, so quick and easy tasks and recipes are the way to go! Kids that age want to be independant and do things by themselves. Getting them a wooden knife will help them safely practice their skills. You could also buy them their own spatula, or own carrot peeler. It will make them feel special and important. Kids this age can be really helpful at the grocery store. They can help you pick and choose what is on your list. You can also get them to complete the treasure hunt activity or even the bingo card at the farmers market. You might be surprised how much they can accomplish in the kitchen as they want to imitate you. Kids aged 7 to 9 years old want to collaborate and work in teams. Despite a short attention span, they’re reading and comprehension is improving. 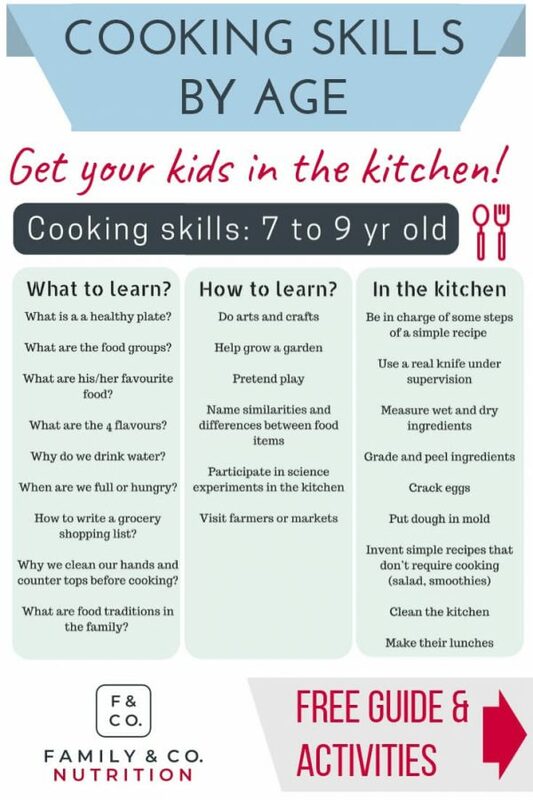 This means 7-to-9 year-olds can definitely help you complete recipes! They have better judgment and coordination of movement. With supervision, they can practice more dangerous tasks like using a knife or the stove top. Get them to do the bingo activity and you may be surprised by their answers! Embrace it and foster their interest. Assigning kids important tasks will boost their confidence and interest in the kitchen. Tweens can be in charge of cooking recipes by themselves in the kitchen! With experience, they can multitask, understand complex instructions, and remember details of recipes. They have good coordination of movement and judgement. They are aware of potential dangers in the kitchen and how to work safely. They can be helpful with daily tasks of preparing dinner and packing lunches. At this age, they can cook the family a simple meal, and certainly pack their own lunch. Way to go! 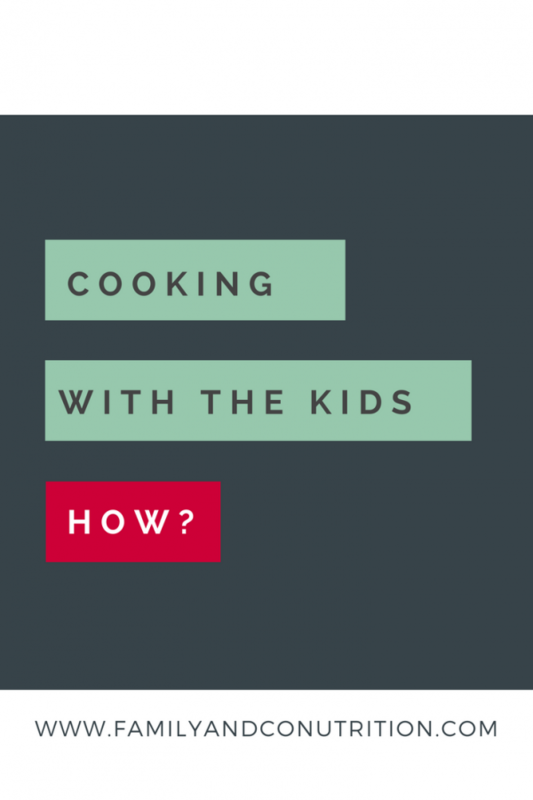 Kids 12+ years: Cooking better than you? Teens can be fully functional in the kitchen even without an adult! They likely have enough skills to complete several recipes. You can catch a break, while they learn some real life skills. Wouldn’t that be wonderful? To get more ideas on how to get your teens cooking click here! Teenagers can rock the kitchen and cook up meals for the family just like you do. 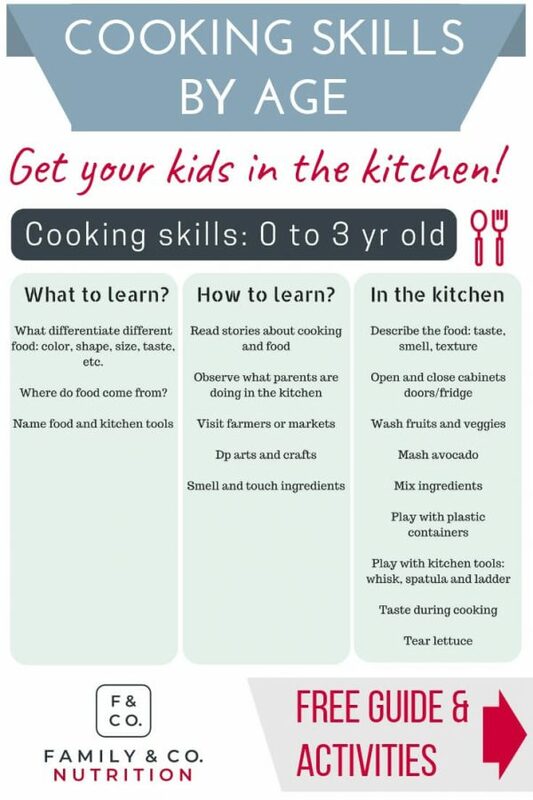 Where to start: How can toddlers help in the kitchen? Here are some ideas to start, regardless of your kids age. Or “top your own pizza” on pita bread! Easy recipes with few steps are a good start for children cooking in the kitchen. There you go! 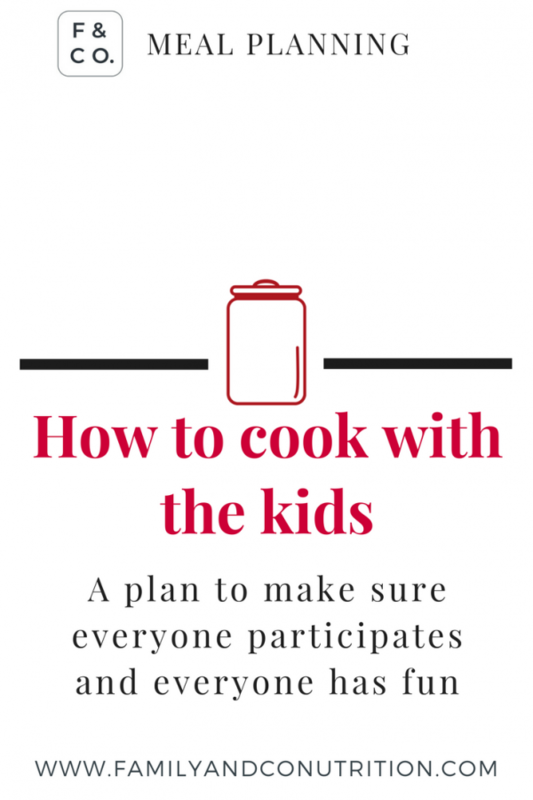 With this complete guide on getting your kids cooking in the kitchen, you’re read to raise little culinary masters! As always, please reach out to us if you have any questions in the comment section below, or via our contact page. Olfert MD, Hagedorn RL, Leary MP, Eck K, Shelnutt KP, Byrd-Bredbenner C. Parent and School-Age Children’s Food Preparation Cognitions and Behaviors Guide Recommendations for Future Interventions. Journal of Nutrition Education and Behavior. 2019 Mar 8. Amin SA, Panzarella C, Lehnerd M, Cash SB, Economos CD, Sacheck JM. Identifying Food Literacy Educational Opportunities for Youth. Health Education & Behavior. 2018 Dec;45(6):918-25. Loth KA, Uy MJ, Winkler MR, Neumark-Sztainer D, Fisher JO, Berge JM. The intergenerational transmission of family meal practices: a mixed-methods study of parents of young children. Public health nutrition. 2019 Feb 8:1-2. Metcalfe JJ, Leonard D. Reprint of “The relationship between culinary skills and eating behaviors: Challenges and opportunities for parents and families”. Physiology & behavior. 2018 Sep 1;193:302-6. Nekitsing C, Blundell-Birtill P, Cockroft JE, Hetherington MM. Systematic review and meta-analysis of strategies to increase vegetable consumption in preschool children aged 2–5 years. Appetite. 2018 Aug 1;127:138-54.